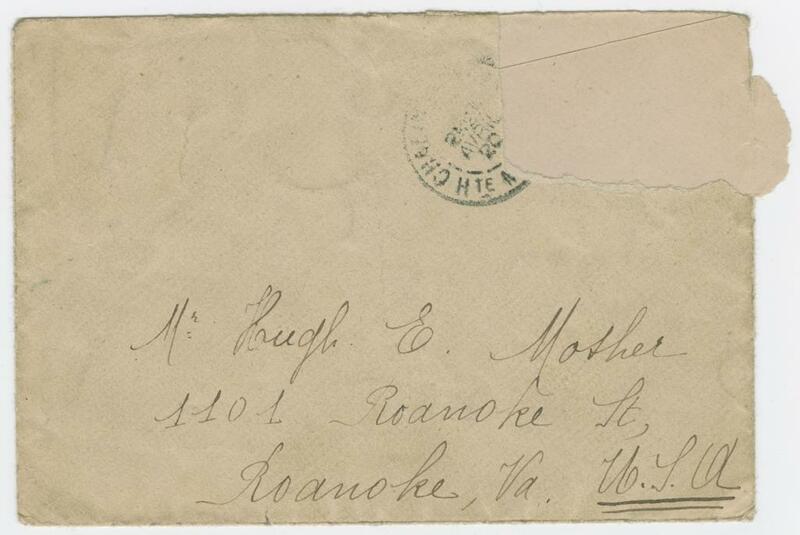 In 1918, 27-year-old Hugh E. Mosher left his home of Roanoke, Virginia for the battlefields in Europe. During his time in Co. B, First Battalion, 602nd Engineers Regiment of the American Expeditionary Force, Hugh continually updated a diary describing his experiences in the war while sending letters and postcards to his friends and family back home. 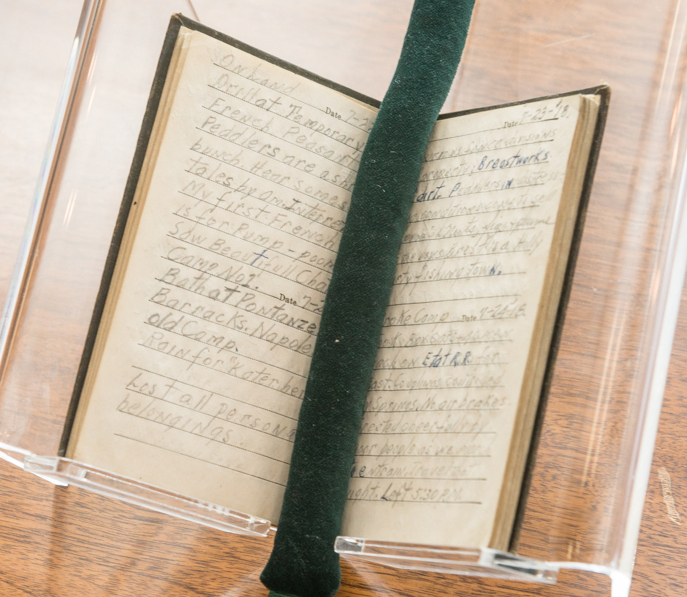 These documents, alongside an extensive memoir written after the fact, were gifted to the Virginia Museum of History and Culture by Hugh's sister, Anne M. Copley, in 1981, one year after his death. Hugh's writings paint a detailed picture of the last few months of World War I and the months following. Through them, readers can better understand the struggles that a soldier may have faced back then, but also how exciting it could be for him to enter a foreign land. 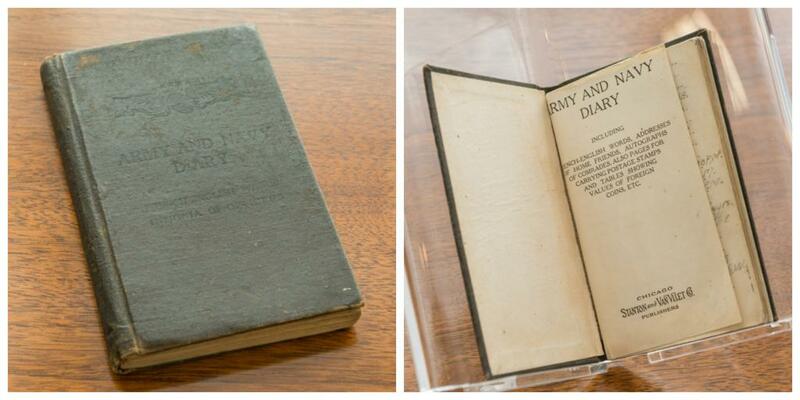 Follow along on our Facebook page and in this article thread as we feature excerpts from Hugh's diary, with his insights into life as a Virginia soldier abroad during WWI. In commemoration of the World War I Centennial Commemoration, we are posting "in real time" on or around the same days he wrote his entries, 100 years later. To view these items in person, please visit our library and request the VMHC Manuscript Collection # Mss1 M8533 a.
Hugh and the rest of his unit arrived in Brest, France on the coast of Brittany after three months of training and twelve days at sea. The weather was rainy and the citizens did not cheer “as these people were worn out with the war and alien soldiers and other hardships.” Hugh also lost all of his personal belongings to thieving soldiers upon arrival. Despite these setbacks, he remained optimistic. He made note of the rich history and culture of the country by remarking on the cobbled streets, learning his first French words, and bathing in an old fortress of Napoleon’s. “I think I’m going to like it,” he wrote. After a few days on the coast of France, Hugh headed east through the cities of Tours and Orléans. On July 27th, he settled into camp in Torcenay, a small village with only three stores in its business section. The town’s largest building was a Catholic cathedral, which Hugh visited every Sunday while camped there despite not understanding the language. Of the 1,000 men in his regiment, over 800 were Catholics. Hugh believed he was the only Episcopalian in his Company. Right outside the village were farms that celebrated a communal lifestyle, giving milk, cheese, butter, and eggs to the soldiers. Some of the Americans, not accustomed to wine, became drunk in the first days at Torcenay and were scolded by their commanding officers. 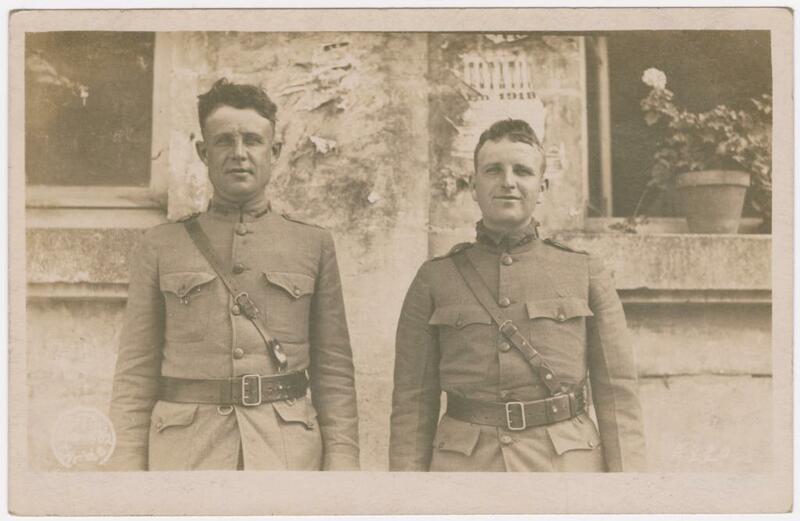 Shown here is a photograph from Hugh's collection of two of his commanding officers, Capt. Krumm, along with Lt. McGallow. 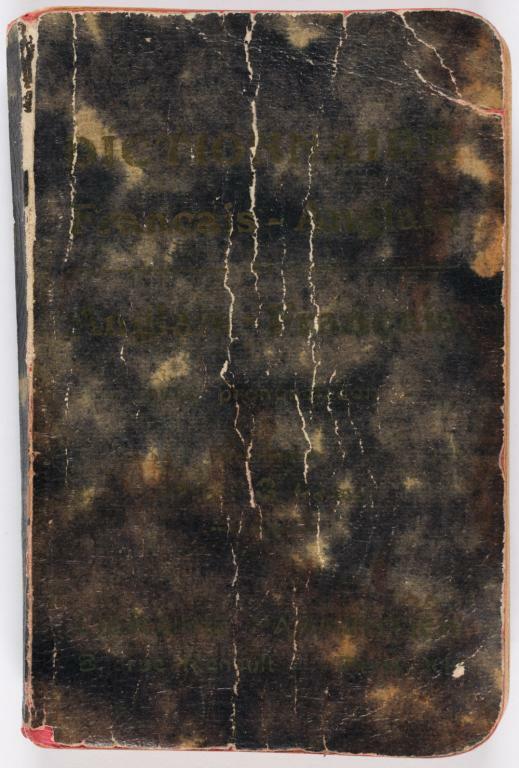 You can see Hugh's handwriting on the back, identifying them. 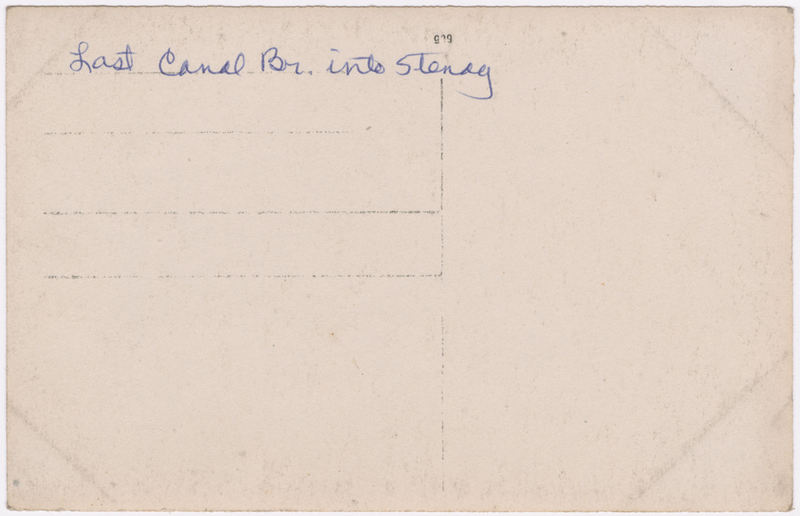 Hugh and the Guyers continue to exchange letters after he leaves Torcenay. 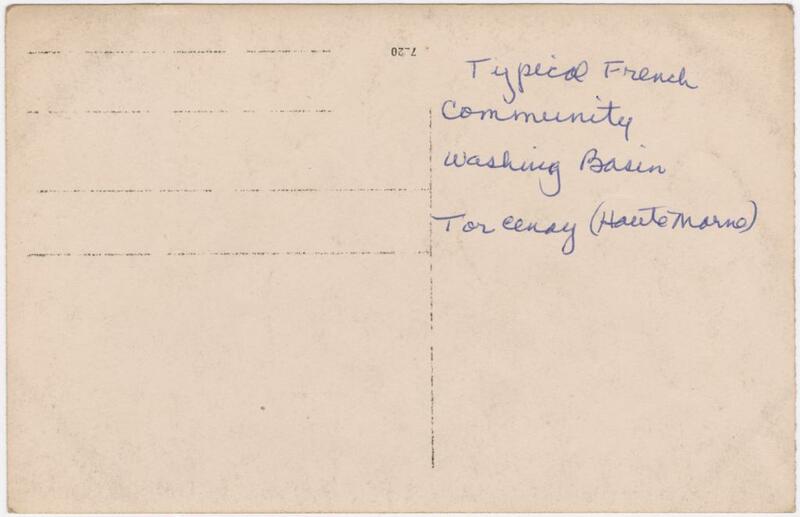 In April 1920, Adele responds to a letter from Hugh when she returns home briefly from school in Wassy (about 65 miles from Torcenay) where she is studying commerce. 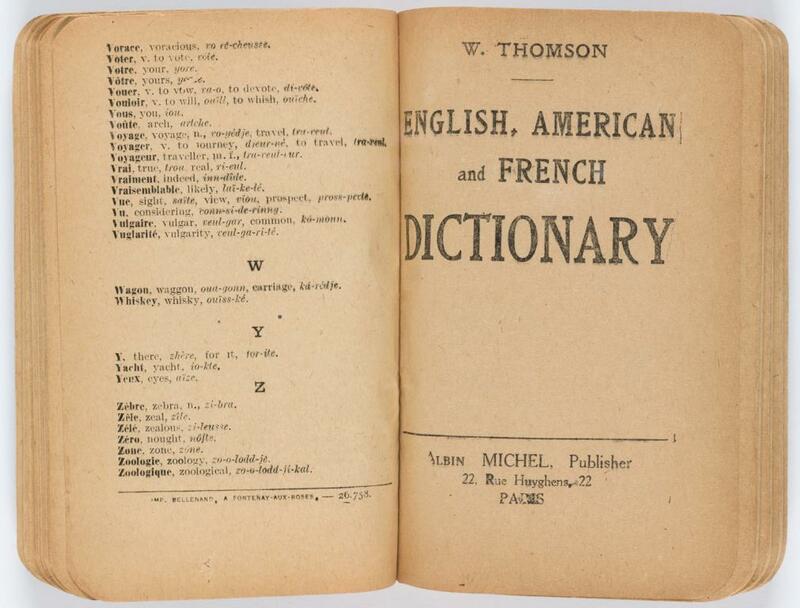 Writing in English, she says, "But you will have correct me many mistakes, my sentences are so bad," and asks Hugh if he still knows French, instructing, "Write me in French, if you can and I'll correct your mistakes." 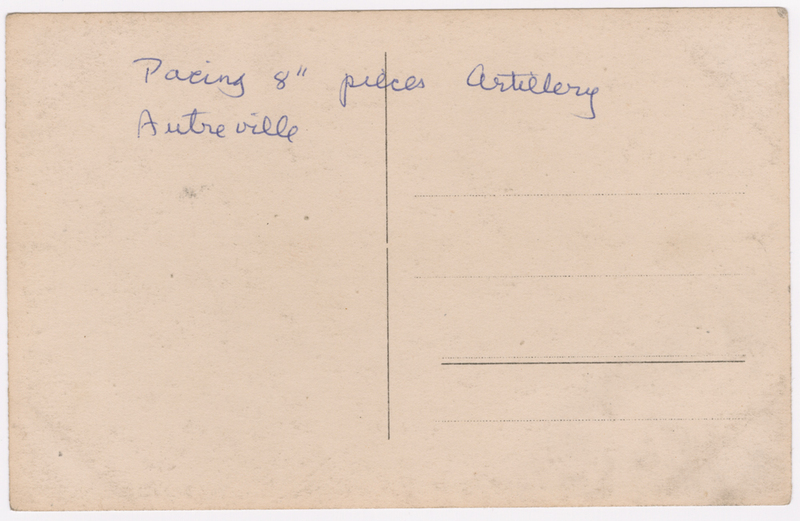 She describes how she continues to play the violin and practice English, how her brother is a sous-chef for the French railway, and writes, “My mother and father speak with me very often about you and we are very happy to know that you will come very soon in France and at first, at Torcenay? We are hoping that your Government will allowed your request!” It is unknown if Hugh ever returns to France. 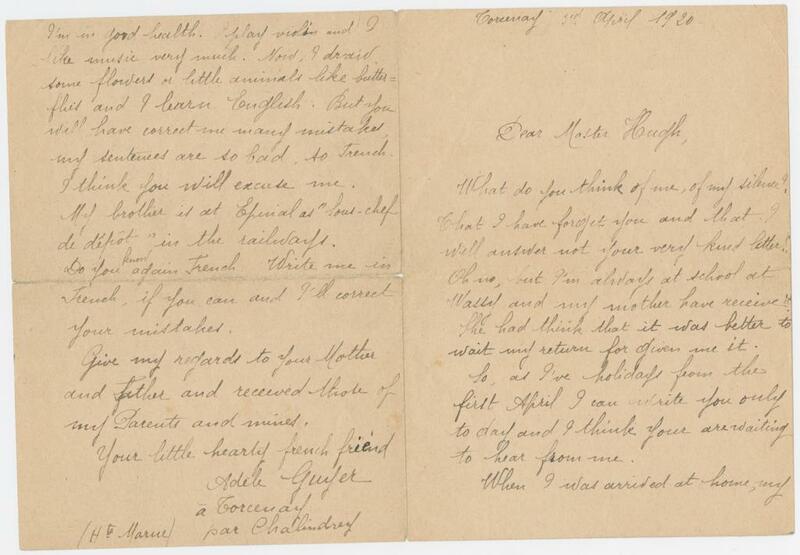 Shown here is the letter from Adele to Hugh on April 3rd, 1920. Hugh spends his final weeks in Torcenay with a mix of training and leisure. In between training, Hugh and his unit attend to chores and have some time for leisure. He sees a baseball game, goes to a movie in Chaumont, and continues practicing his French. They visit Langres, of which he writes, “This is our first big city. It was full of antique buildings, winding streets, a fort, and a cathedral. I had a steak dinner at an American YMCA, saw a French funeral from the cathedral. I bought an English-French dictionary.” Hugh’s fascination with big cities and old buildings is a recurring theme during his stay in Europe. He also runs into two men who, like him, are from Roanoke, Virginia – Lt. Ernest Baldwin and Billy Beal – at a rest billet near Torcenay. Billy is the son of Hugh’s mother’s cousin. Hugh and his unit leave Torcenay on September 15, heading for Ancemont. 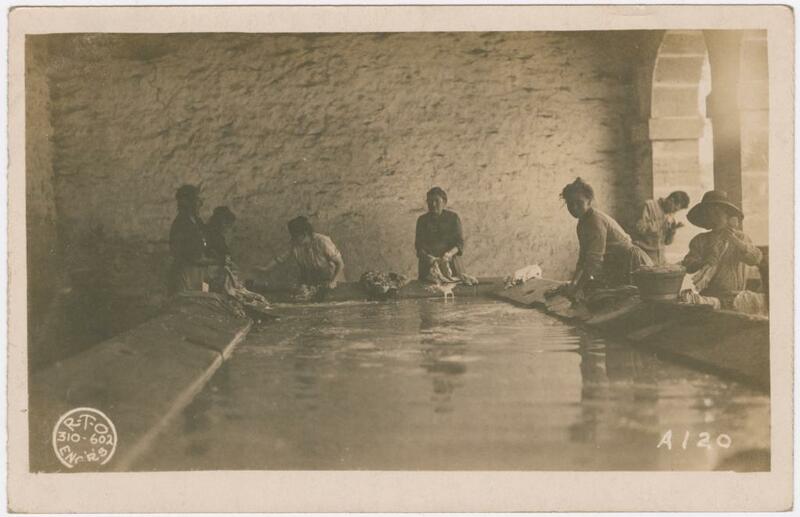 Shown here is a postcard of French washerwomen, like the one who attended to Hugh’s clothing, and the French-English dictionary Hugh bought in Langres, France. 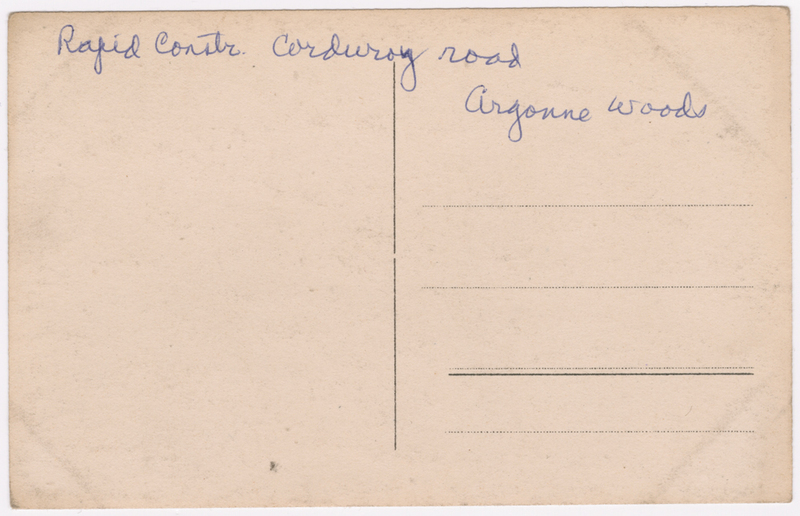 Shown here are Hugh’s postcards of Aubreville and the Argonne woods. The push on the Hindenberg Line has continued for almost a week, as Hugh and his unit continue to repair and rebuild roads to allow for access by troops and equipment. Consistent rains make this work even more difficult. On September 26, German troops have been pushed back almost eight miles, with some being taken prisoner amidst the retreat. Villagers are wounded, the sick drop out of the ranks, and the Americans have left their food behind to pursue the fleeing Germans. Hugh has had no food for the past five mealtimes except for emergency rations. “Today I feel that I really am in a war,” he writes. 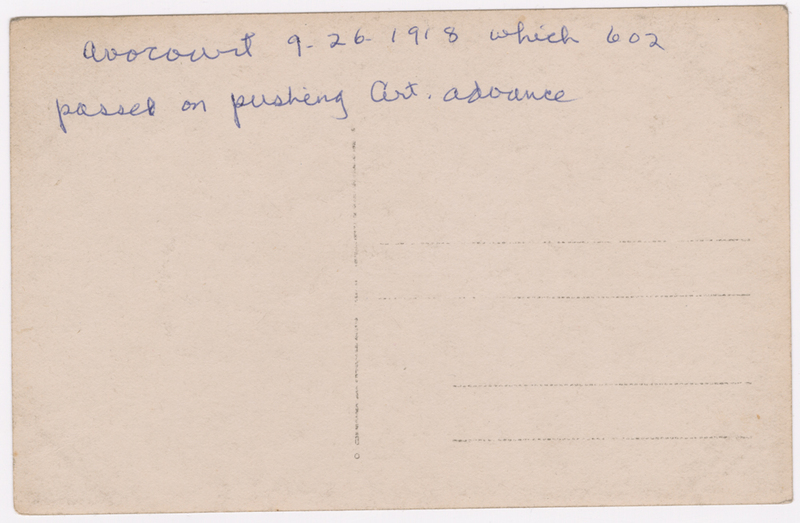 By September 29, the Germans are 10 miles away and American troops are still without provisions. 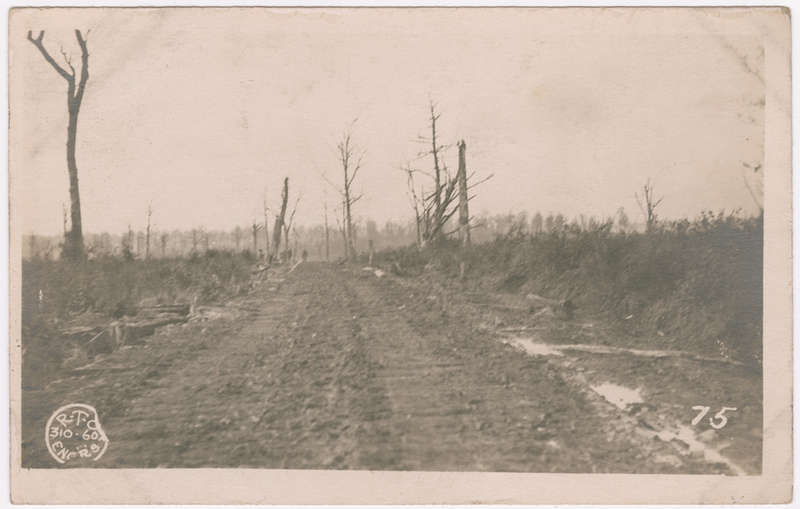 Hugh continues repairing roads throughout early October as the Americans chase after the Germans. 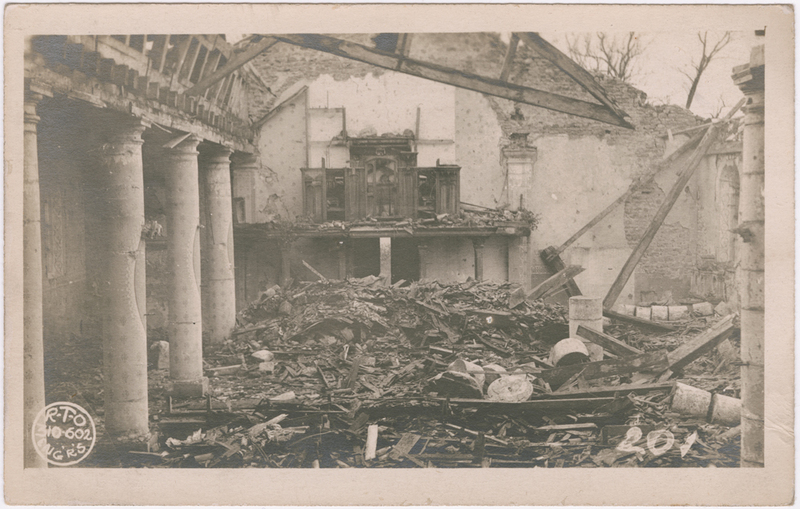 Shown here are Hugh’s postcards of the destroyed village of Avocourt. 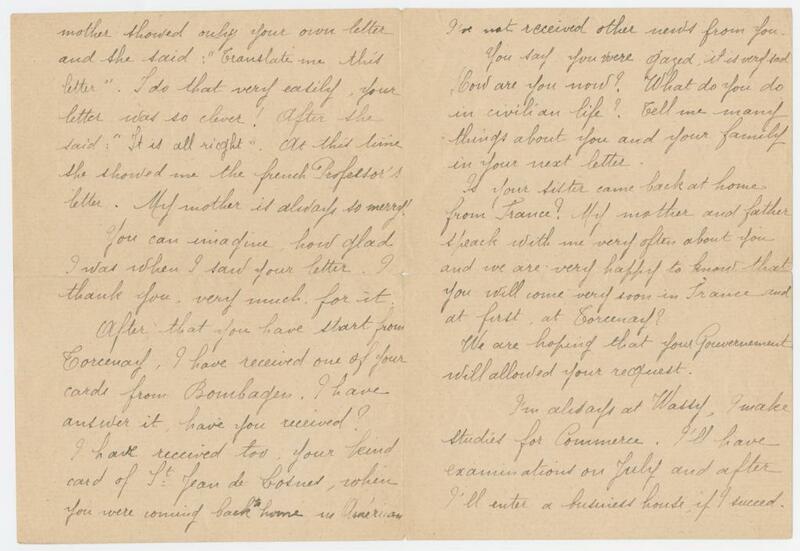 Shown in the image rotator at the bottom of this page are Hugh’s letter to Nora, written on YMCA stationary, along with his postcards from Cheppy. 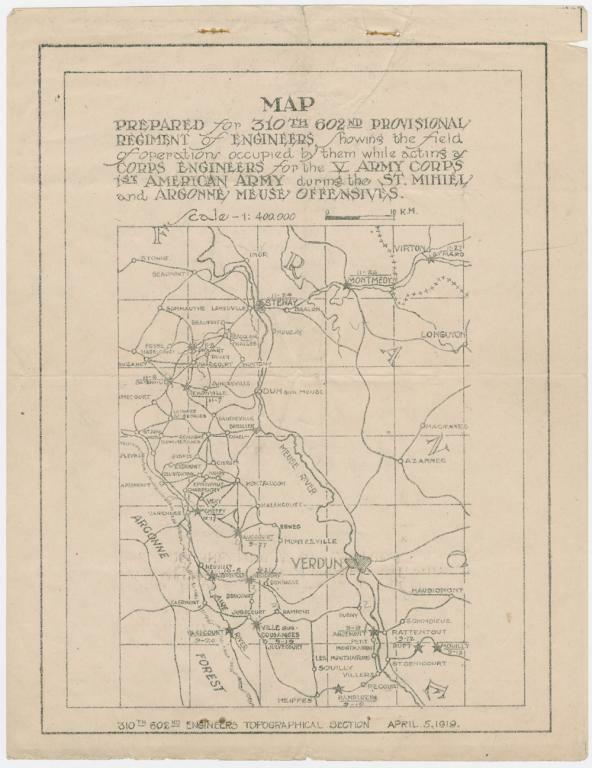 Shown here is a map of the Meuse-Argonne Offensive used by Hugh's unit. On November 4, Hugh and his unit leave Cierges for Barricourt, several dozen miles to the northeast and near the Belgian border. Three days later, he writes, “We got news that two German Generals came through our lines carrying white flags to talk peace terms with General Foche. It looks like the beginning of the end. It takes time to make a peace.” On November 9, he sees his old French friends again. They give him an “allumette de fer” or cigarette lighter that they made for him. 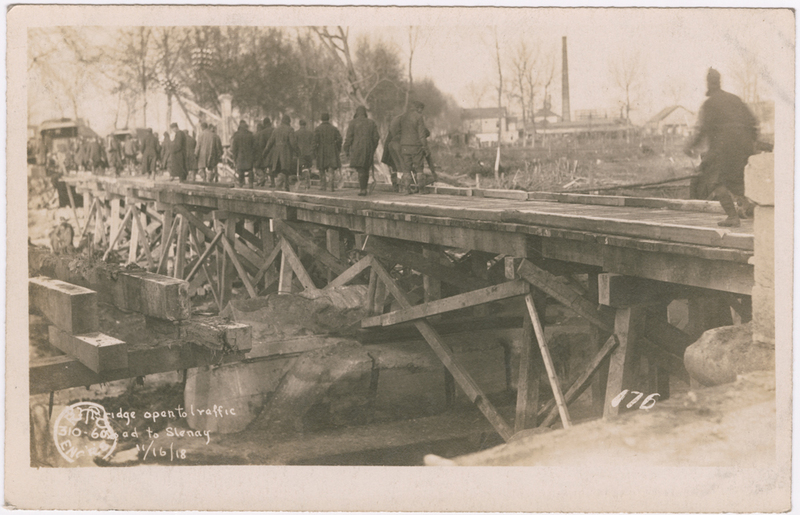 Shown here is a bridge built by Hugh's Co. B from Barricourt to Stenay. The caption reads "Bridge open to traffic / road to Stenay / 11/16/18." Envelope front for Hugh's letter to Nora. 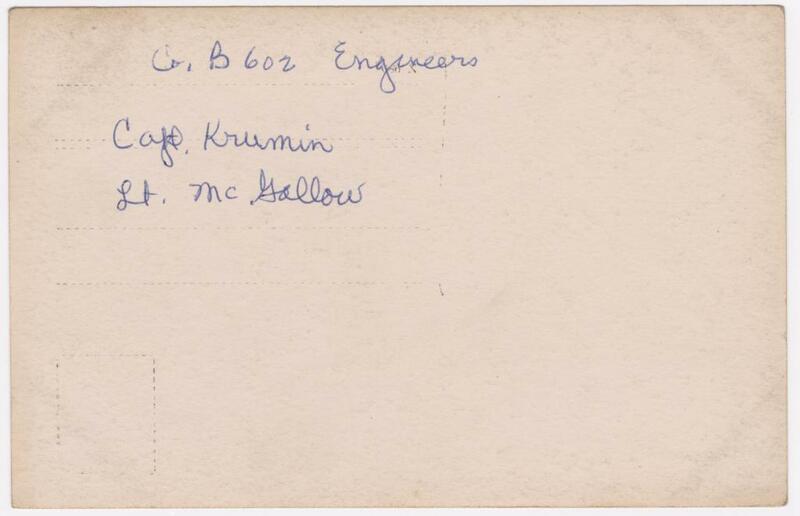 Envelope back for Hugh's letter to Nora. Hugh's letter to Nora, page 1. Hugh's letter to Nora, page 2. Hugh's letter to Nora, page 3. A postcard from Hugh's brother William to their mother. 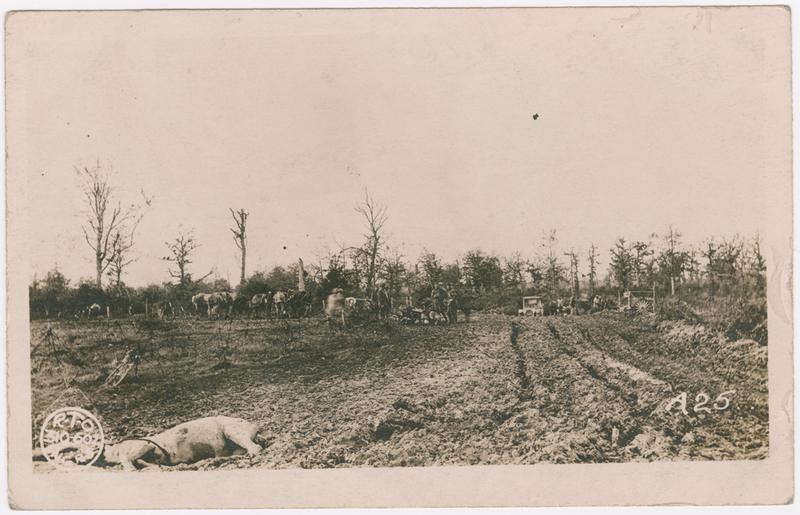 A postcard of Hugh's camp near Cheppy. A postcard of the rock quarry near Cheppy. 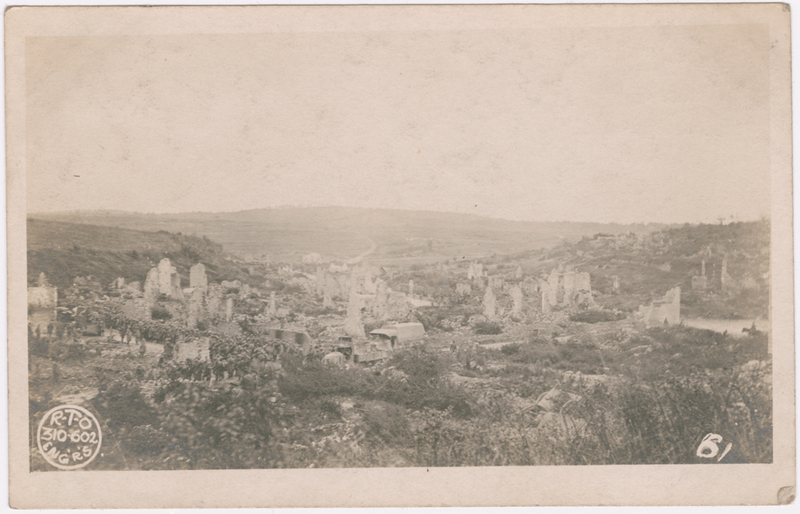 A postcard of Cheppy, described by Hugh as "Argonne hell."